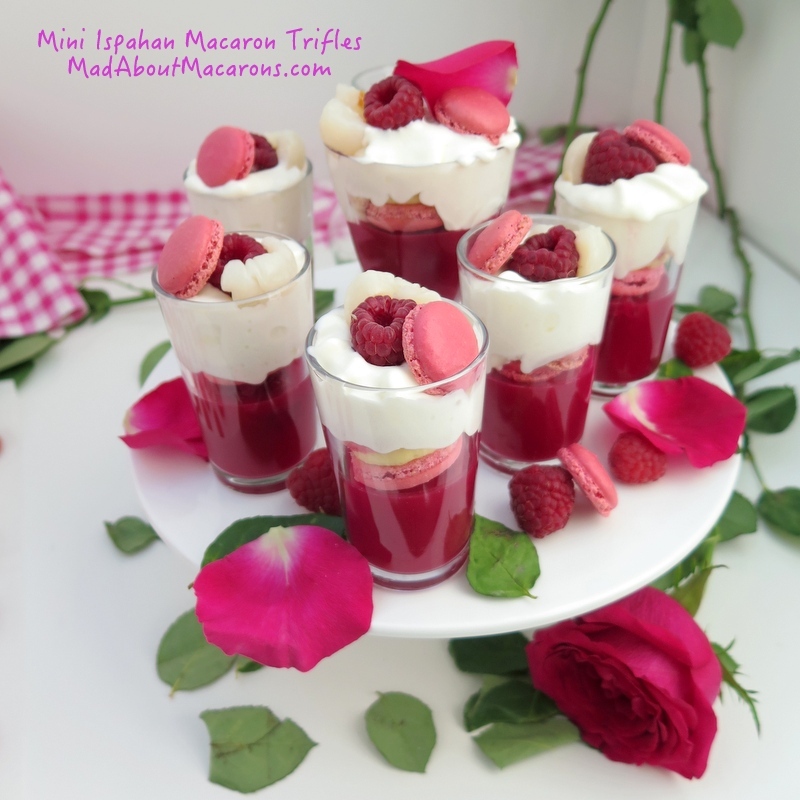 Mini Macaron Trifles – Ispahan Style! 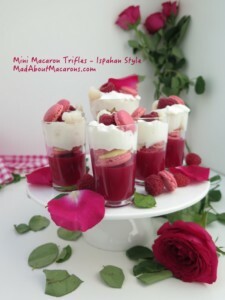 I have been itching to show you these mini macaron trifles – Ispahan style! Last week, as I was listening to Abba, my kids caught me using my macaron spatula as a microphone. As I was transported back home to Scotland in the 80s – before you could say Super Trouper – my nostalgic mind had turned to trifle. You see, Mum always made her best and biggest celebratory trifle for end of year parties but with such a huge festive spread on the buffet table, we didn’t have that much room left for dessert – which was often frustrating looking at its pretty pristine layers of fruity wobbly jelly, sherry sponge, custard and cream. Hence my urge to make mini versions. They’re twice the fun and a fraction of the size and apparently, steadily growing as a mini treat trend. I have a number of mini French teacakes in Teatime in Paris (financiers, madeleines and tigrés) but I couldn’t resist using Parisian macarons to replace the classic trifle sponge (macarons are gluten-free), as they fit a shot glass perfectly – and, finding a handy few rose macarons left in the freezer, whipped up these mini macaron trifles in no time, adding a touch of Parisian “Ispahan” inspiration. Why Ispahan – What is it? Ispahan is a Damask rose named after the city Isfahan (French: Ispahan) in Iran where it was apparently discovered in one of the city’s beautiful gardens. The rose has been made famous in Paris by pastry chef, Pierre Hermé. He is renowned for his Ispahan macaron, created while previously working at Ladurée: a bright pink macaron, filled with rose cream, lychee and raspberries. Hermé is originally from Alsace – the region famous for their French Gewürtzraminer wines with tones of rose and lychees. You can see why he chose such a romantic combination with raspberries to conjure up a rosy selection of Ispahan pastries. Liz’s Strawberry Trifle with Mascarpone Cream at That Skinny Chick Can Bake. 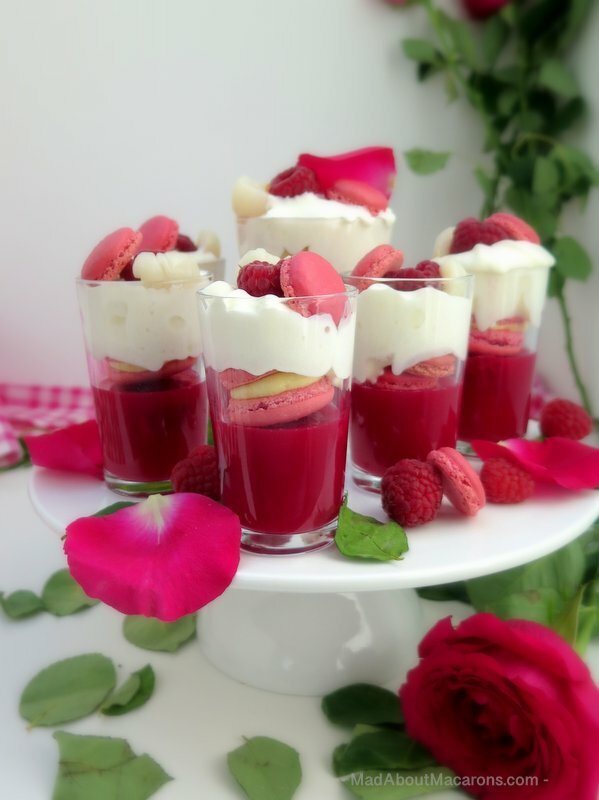 Why not use the macaron recipes in my books, adapting the trifles to suit the flavours? Rhubarb and Poppy macarons (great with strawberry trifle) … the list goes on so over to you! Place a large glass bowl in the fridge for the Chantilly cream later. Make the jelly: Soak the gelatine in cold water for 5 minutes. Heat the raspberry juice in a saucepan (don’t boil), squeeze out excess water from the gelatine and dissolve into the warm juice. Add 1 tbsp rose syrup. Drop in a couple of raspberries in each shot glass and top with the jelly, filling up to a third of the way up. Using an electric whisk or stand mixer, whip up the cold cream in the chilled bowl and add 1 tbsp rose syrup (or 2 tsp sugar and 1 tsp rose water) until whipped firmly. Once the jellies are set, top with a macaron then the Chantilly cream and decorate with a lychee and raspberry. Pressed for time? 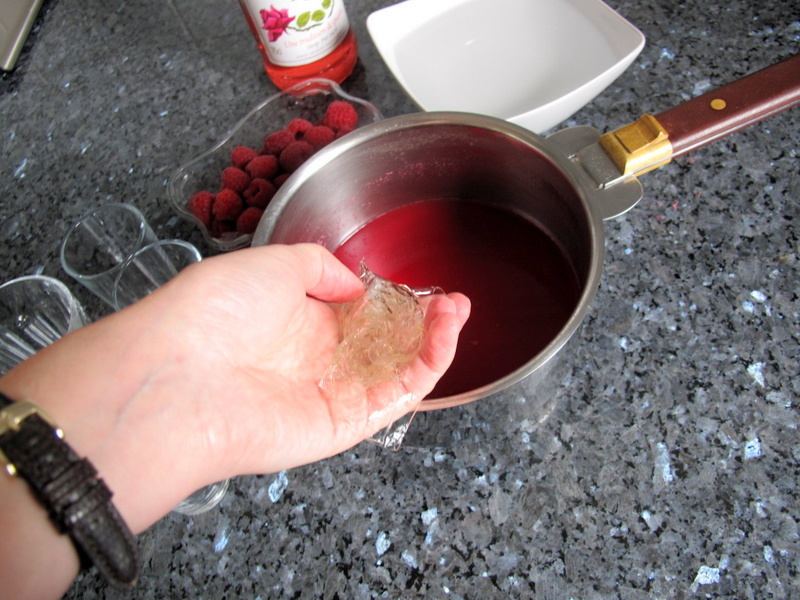 Make raspberry jelly using half a packet mix and follow instructions. 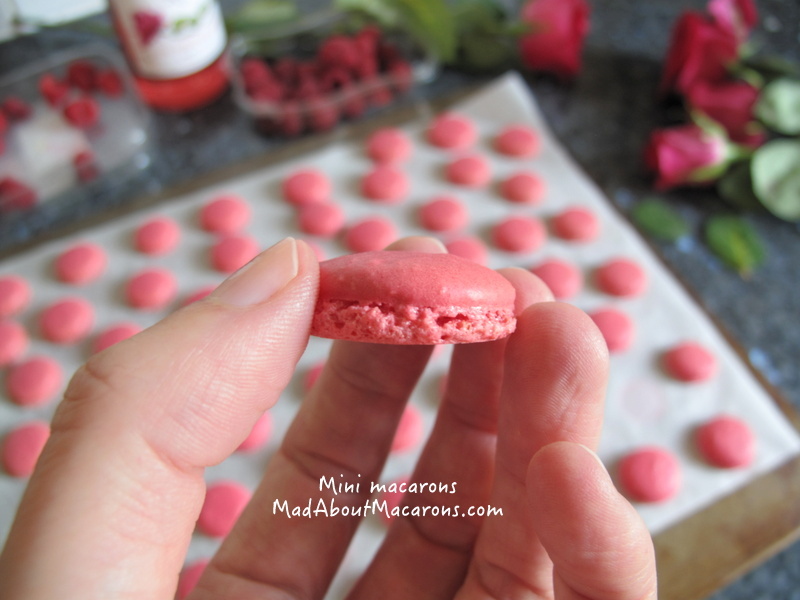 Either buy rose macarons or make them yourself using the recipes in my books! Don’t forget homemade macarons freeze well. If serving with wine, serve with a late harvest Gewurtzraminer or pink Champagne. NUTRITIONAL INFORMATION: 230 Calories per serving (serves 8); 3g proteins; 13g lipids. Elegant and delicious, can’t wait to try these little beauties. Thanks for sharing. Great pleasure, Bea. They’re so different to the classic British trifle – the flavours together are a surprising taste but it’s still a trifle with a bit of Parisian fun! It looks so beautiful!! A great dessert idea for me. Thank you for sharing the recipe! This is something Mark and I will love! I can’t wait to try it, Jill, and am always looking for something to serve after a Persian meal. As an aside, we just got a macaron store here and they are the worst I have ever had. Thick, and dense, and artificially flavored. Yuck. There ought to be laws… I do have another resource for better ones, but this was so disappointing. Thanks so much, David. How exotic on your persian meal – bet it’s full of delicious spices. This would be a lovely finish, what a great idea! As for the macaron store on artificial flavours, I understand you. There is one that recently opened in Paris too but I couldn’t even mention it on le blog since they were just so overly flavoured. Even the packaging weeks later smells of them! Long time since I made trifle Jill. Your version is so much more sophisticated. No macarons in the 80s but there was music. So in true ABBA style, Thank you for the Music. You’re too kind Cynthia – thank you! I loved your Christmas trifle and talk of your British memories for such a deliciously nostalgic dessert. I’m so happy to see how beautifully these turned out with the macarons, Jill! Just perfect! I can imagine just how wonderful the flavors are together, too! So many of my favorites! Thank you for including my patriotic trifles as they are not just patriotic for the US, but the UK, France and Australia! 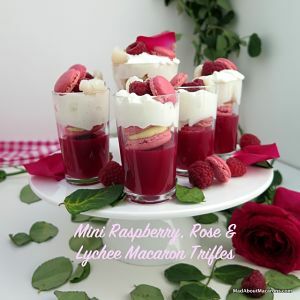 🙂 Now I’m dying to make mini-trifles! Raspberry, rose and lychee are just wonderful – but add some pink Champagne to that and it’s a serious groaning experience. Roll on the next party to serve them!